CASBs (Cloud Access Security Brokers) can provide visibility and protection for the myriad of sanctioned and unsanctioned cloud applications being used by employees in organizations today. Office 365 is undoubtedly one of the most popular, with most business-grade email and collaboration now taking place in this cloud environment. Attend this session to explore the best route to full Office 365 security. Digital transformation is driving change across the world, creating new opportunities to boost business productivity while cutting the costs of infrastructure and operations. Increasingly distributed organizations are re-architecting their networks and security to move their most valuable data and applications to the cloud in order to give their users much richer, faster, less expensive access than ever before. Enabling remote sites and off-network users to securely connect direct-to-cloud is the new challenge facing enterprises and government agencies. How can distributed organizations achieve the reliable, secure connectivity to the cloud they need? Many are now using internet technologies for connect all of their users to cloud-based applications more productively and cost-effectively than ever before. Today’s digital transformation initiatives frequently begin with moving applications and data to the cloud. But traditional networking and security infrastructure, such as backhauling data from remote locations to central offices over MPLS lines, can’t keep up. Fortunately, new approaches that also move connectivity and security to the cloud are rapidly overcoming these hurdles. Technologies such as direct-to-cloud SD-WAN and site-to-site VPNs dramatically cut the cost of connectivity. However, they put pressure on other parts of the organization to adopt new ways of defending each site against internet intruders, protecting the use of web content, and securing data stored in cloud apps. In this webcast, we’ll discuss a new, integrated approach to connectivity and security. Used by enterprises and government agencies around the world to manage as many as 1,500 sites from a single console, Forcepoint’s branch security solution enables highly distributed organizations to improve productivity, reduce costs, better manage risk, and streamline compliance. Microsoft Office 365 includes native security at various levels, depending on your license. But is that enough? Osterman Research discovered that over 73% of organizations will choose to either supplement or replace native Office 365 security with third-party solutions by 2019. Innovation thrives when people can collaborate in a trusted manner, leveraging data creatively and freely through technology. This intersection is also the point of greatest vulnerability for your enterprise and the primary source of security breaches driving cyber risk to all-time highs. Join Forcepoint's Raffael Marty, VP Research & Intelligence, and Carl Leonard, Principal Security Analyst, for a webcast discussing the most pressing cybersecurity issues – and what you can do to protect against them. For most organizations, compliance is a bottomless pit of cost and effort. Too many infrastructure components and configuration points, too much data and too many places to put it—there are just too many places for threats to hide. Watch this webcast and learn how to make your organization’s journey to the cloud as safe as possible. Some approaches to information security simply won’t deliver the results required for effective governance. Addressing head-on the primary issue—risk—is the key to a successful strategy. Find out how a proactive approach to information security now can help your organization avoid compliance issues later. CASBs (Cloud Access Security Brokers), or CSGs (Cloud Security Gateways), are part of the rapid rise of emerging security technologies designed to enable digital transformation. With these solutions, organizations can experience the benefits of innovation and collaboration that cloud applications bring while maintaining visibility and control of their data. Attend this session to learn more about the need for and use of CASBs in today’s organizations. Innovation thrives when people can collaborate in a trusted manner, leveraging data creatively and freely. This intersection of people interacting with data and technology will also drive cyber risk to all-time highs, according to new insights from Forcepoint researchers and data scientists. Our networks are bigger and more complex than ever, but the charge remains the same: connecting many locations and protecting many devices. Forcepoint offers the most scalable SD-WAN solution, combined with the industry’s top-rated next-gen firewall—all managed at enterprise scale from a single policy-based console. For most SaaS developers, security features aren’t top of mind. Because there are no real standard practices yet, the risks presented by the myriad SaaS applications varies widely. Cloud access security brokers (CASB) provide visibility and control for cloud applications (SaaS, PaaS, and IaaS), and an increasingly important part of a CASB solution is to extend data loss protection for data stored in the cloud. - Who is the “user”? Extending the necessary control and policies in the cloud can be a daunting task for many enterprise customers. But with the right tools in place, it doesn’t have to be that way. Driving Office 365 adoption is an important goal - 87% of IT professionals say it's a top priority. Yet few have fully migrated their users and apps due to concerns around security, compliance and poor user experience caused by network architecture limitations and constraints. Forcepoint's Office 365 solution can help you move past these barriers by providing the confidence you need to fully adopt the suite. 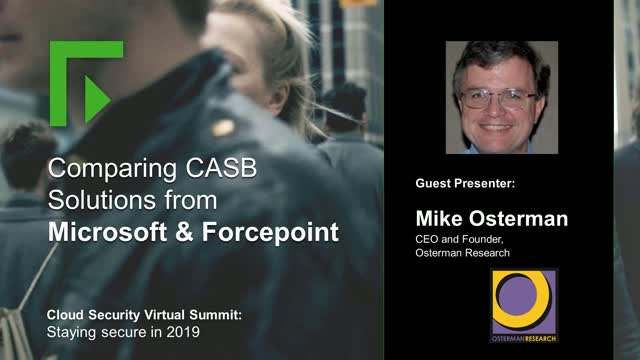 Join us as we explore these use cases and demonstrate how Forcepoint protects Office 365 and your expanding cloud environment. Join IDC Senior Program Director for Cloud, Carla Arend, Salesforce Director for Security Customer Engagement, Arun Singh and Forcepoint Global CTO, Nico Fischbach for a discussion on security and a cloud-first strategy. This 50-minute webinar addresses the top five information security lessons IT professionals have learned while transitioning to the cloud. * Leveraging User and Entity Behavior Analytics (UEBA) for protection"
Driving Office 365 adoption is an important goal—87% of IT professionals say it’s a top priority -- yet, few have fully migrated their users and apps, with security, regulatory and resource challenges often the cause. Security companies too, face these same fundamental challenges. As a recent Office 365 adopter, Forcepoint has first-hand experience securely migrating users to the cloud. Join Forcepoint’s CIO and Chief Scientist as they share learnings, surprises and insights from our own migration. A traditional threat-centric approach focuses on prevention and detection of attacks that exploit vulnerabilities in the software. The cloud environment abolishes the “walls” that helped us feel more protected. Cloud application security requires a new user-centric approach that respects the dynamic nature of users and how they interact with data, enabling organizations to recognize and respond to real risks. Today, the average enterprise customer uses over 1,000 cloud applications, including SaaS (Software as a Service), PaaS (Platform as a Service), IaaS (Infrastructure as a Service), or even homegrown cloud applications. To mitigate security risks, IT leaders need to ensure assets housed in these cloud environments are secure. According to a recent Forcepoint security survey, 56% of business decision-makers stated that it’s difficult or very difficult to promote innovation through a move to cloud while maintaining corporate security and governance. Distributed networks are the new reality of today’s mobile, global workforce. Transforming cloud connectivity and security within these networks is the new challenge. The right connectivity and security through digital transformation can provide important benefits, including increased productivity and improved user experience at a much lower cost, whether it’s for accessing cloud applications or legacy applications. Being able to use the same policies, the same tools for visualizing what's happening on a network, and extending that seamlessly into the cloud will help security teams understand use of and manage risk.